Reading aloud to kids has been proven to help build vocabulary and language skills; give them background information to make sense of what they see, hear and read; and lets them use their imaginations to explore people, places, times and events beyond their own experiences. 1. Reading aloud sets the stage for school readiness. According to Reach Out and Read, an organization that partners with doctors to prescribe books and encourage families to read together, 66% of children in the U.S. are not proficient in reading by the end of third grade. The first five years of life offer a critical window for learning, with rapid brain development that does not occur at any other time. If children miss the opportunity to acquire foundational language skills, they are set up for immediate struggles with literacy as soon as they arrive at school. 2. Reading aloud stimulates language skills, cognitive thinking, and enhances memory. Reading him books will help teach him context for new words. For instance, a book about a cow will use certain words (like cow and spots) repeatedly and in a variety of ways. The pictures will help sharpen his memory for those words. You can also narrate your daily activities using descriptive vocabulary. When you say, "Let's put on your red-striped shirt" or "I can feel the warm sand on my feet," you're helping your baby get ready to say his first word. 3. Reading aloud can help build your child's vocabulary. 4. Reading aloud helps children bond with their parents. The intimate experience of reading yields important lessons about behavior, feelings, and the enduring bonds of relationships. It's a gift for time-challenged parents who may feel guilty about missing special moments with their kids. Snuggle together before lights-out, or schedule a Sunday morning reading hour, and you rekindle emotional closeness as well as impart important lessons, ease difficult transitions, heal personal pain, and celebrate family life. 5. Reading aloud lets children associate reading and books with warm, pleasant feelings. Making it a part of your regular family routine will teach your child that reading is something to be enjoyed, not a chore that needs to be done for school. That attitude will foster a love of reading that will take her through school and into adulthood. So now that you know why it's important, how do you actually get a squirmy baby to listen to you read? 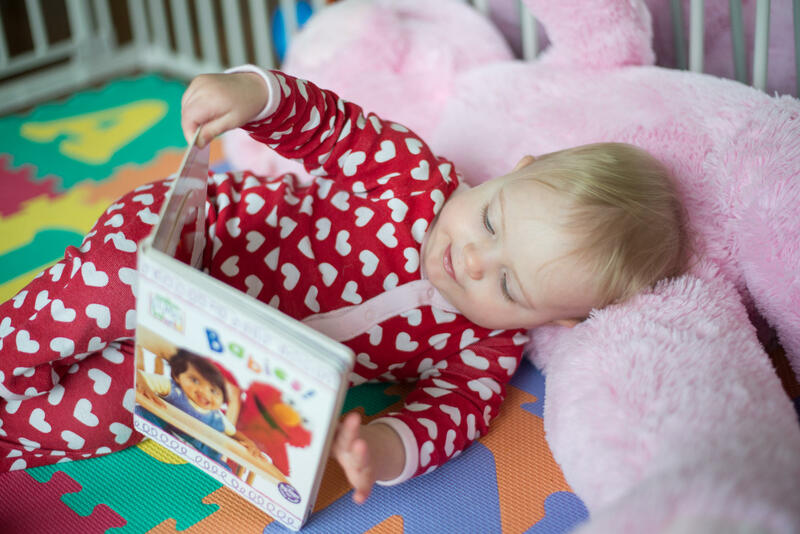 You can also check out these tips from Reading is Fundamental, Inc.
Do you have any tips for reading to baby? If so, let us know in the comments below. Some bits of scientific research seem so obvious, you wonder why anyone even thought to do the study. But this seemingly obvious result out of the UK does have some surprises. Researchers found that kids who read for enjoyment end up doing better in school - which most of us probably realize. But it turns out that when researchers controlled for many different factors, reading for pleasure actually outranked parental education as a major factor in kids' academic progress. So if you want disadvantaged kids to learn more in school, cultivate a love of reading outside of it.